Ah, out of the mouths of babes. 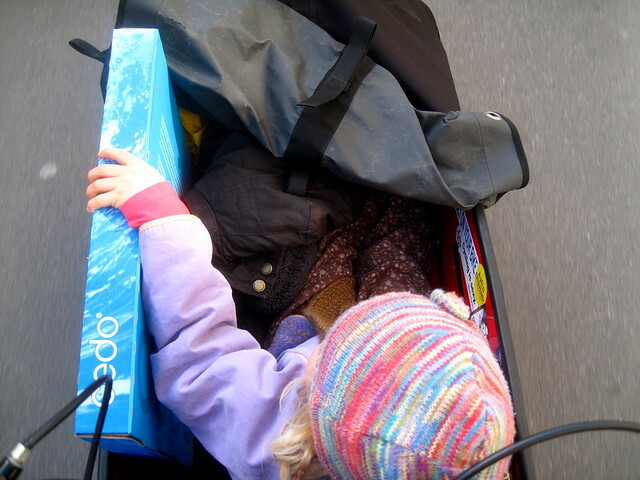 Last Sunday I dropped Felix off at football training and then headed to a hardware store with Lulu-Sophia in the Bullitt. She's three and half. We talked as we rolled along, as we always do. At a red light she looked over at a motorcyclist with a passenger on the back. She commented on it. "Daddy... look. There's a motorcycle with TWO people on it!" Daddy replied with "Yeah! I guess they're friends or something, aren't they?" "Yeah." She thought about this for a moment. "We're two people on this bicycle, too!" "Yes, we are. We're friends, too." The light changed green and we rolled onwards. What then came out of her little mouth and clever mind amazed me. She must have been looking around at the traffic after making her observations. "When people are in cars, you can't see them, can you?" "No, you can't", said Daddy. But you can see people on bicycles, can't you? And people walking and those people on that motorbike." "Yeah... cars are silly, aren't they, Daddy? You can't see the people in them. That's silly..."
That made my heart sing. The world's youngest Urbanist. Right there on my bike. She's only three and a half so I haven't had chats with her about why bicycles are cool and safe and good or why too much car traffic is a bad thing for cities and safety and the public health - like I have with my 9 year old son. Although the time she has spent in cars in her three and a half years totals no more than five or six hours. This was pure observation on her part. And a pure, logical, innocent and human conclusion. Being able to see people around you in your city is... a good thing.